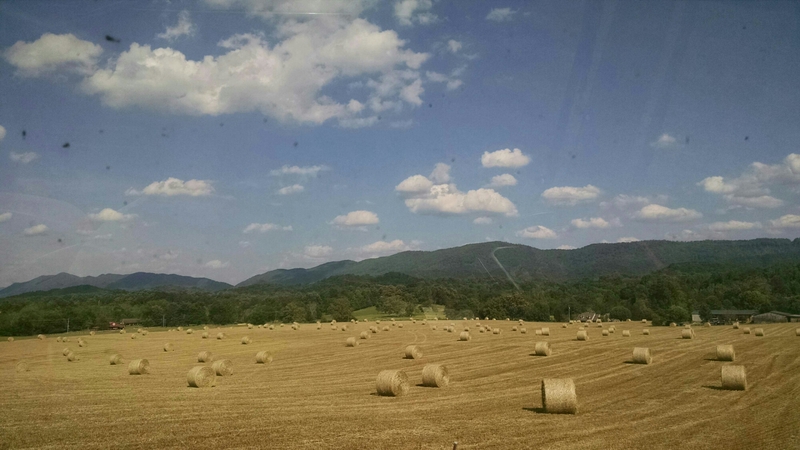 It’s hay time on the farm. Typically they bale hay (which is a feed source for the cattle in the winter when the grass is dormant) twice, maybe three times a year if weather conditions are favorable. They do round bales meant for cattle which are easier to move with equipment and only a few square bales for my horses because those are more labor intensive. 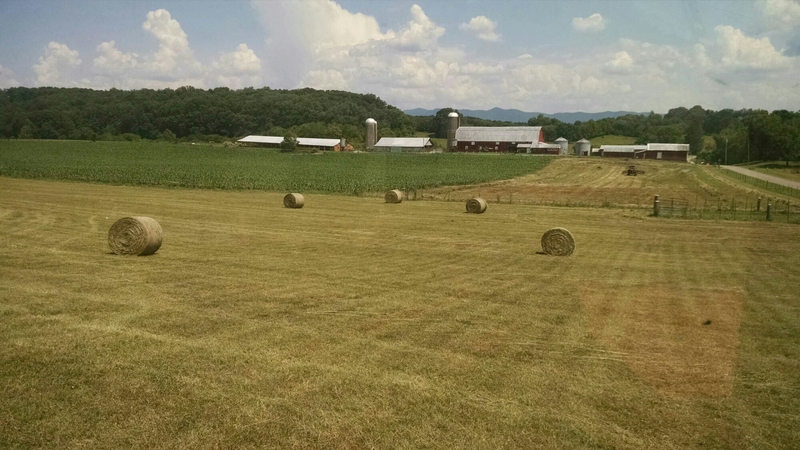 Since most farm work is seasonal, and like many farm related chores dependent on the weather – hay time means many things to our family. It means long days for Lynn – who comes home covered in dust and equipment grease. It means it is hot and muggy. 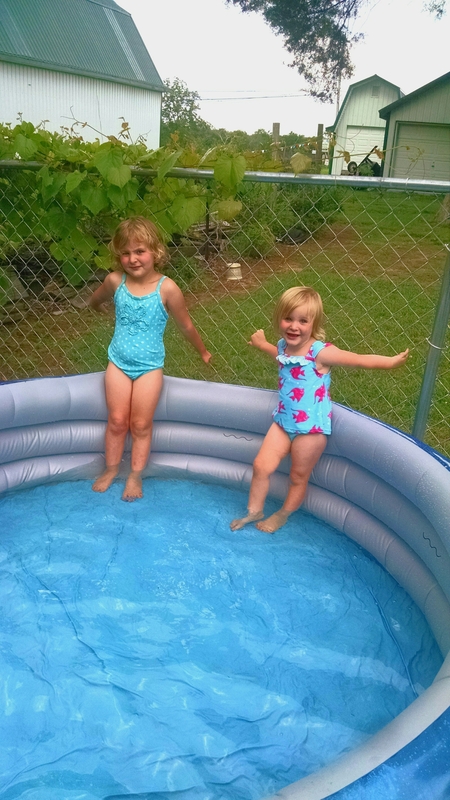 And the girls get to play in the wading pool or sprinkler in the afternoons. 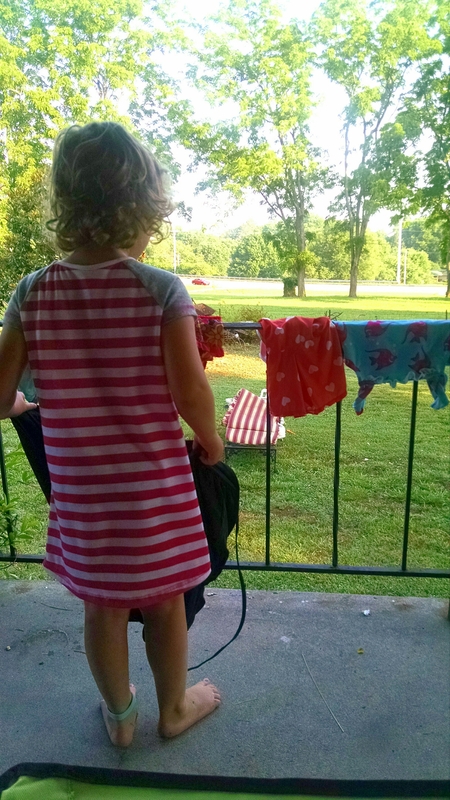 Caroline is hanging the freshly laundered swimsuits out to dry, since the dryer makes the elastic brittle. 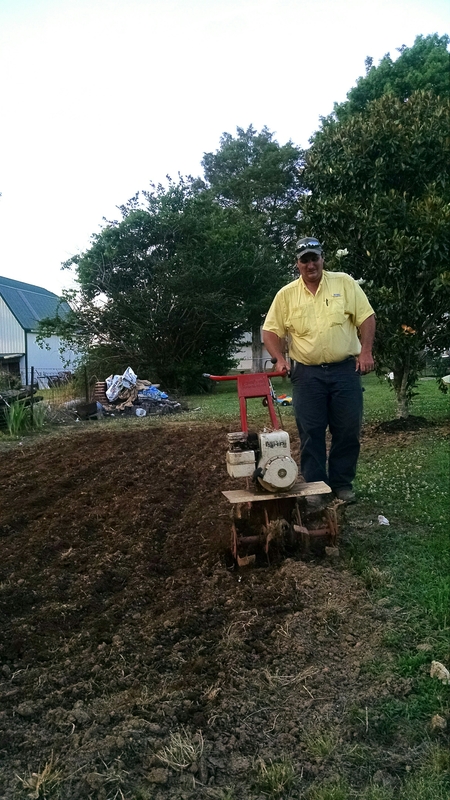 It means we have FINALLY had a chance to get the garden worked and planted. It means the pop-up thunderstorms sometimes end the farming day, which frusterate Lynn but thrill me since sometimes he can come home before 7pm. It means my work schedule has slowed down a bit and I’m almost down to “regular” work hours… I’m planning and preparing for summer horse shows, beef shows, the late summer awards banquet. The work assignment I dread most all year happens this time of year, a week away from my family at 4-H camp. I don’t dislike camp itself and I think it is a fantastic opportunity to for the young people I am in charge of for the week. My stomach churns when I think about spending a week 2.5 hours away from my girls who need their Mama especially at bedtime, and my Type 1 diabetic husband who is prone to low blood sugar at night. It just feels wrong to leave them. BUT, my job is steady and provides good health insurance coverage for the family. And I enjoy what I do…It’s just the being away that bothers me. Real official hay-season summertime is here. We’ve finished out first watermelon and the girls eat popcicles in their swimsuits. Sometimes we all pile in the tractor and ride with Lynn while he’s working for some family time. It’s a long hour, hot and sweaty, hard work rhythm of life – but it’s our life and for that I’m thankful.